The right cold-weather accessories will keep you cozy and chic, and this infinity scarf is a sumptuously soft option. The fashion women scarf is so versatile. It's long enough to wear it all around your neck or just draped low. You could also wrap the Circle Loop Scarves around your head like a hood when the weather really gets cold. Not to mention the yarn is luxuriously soft! With its stylish fashion knit design, wear yours with a heavyweight sweater or your favorite coat. Please rest assured that all our scarves are taken in kind. The most real effect, the color you see, is the color of the products you receive. COMFORTABLE MATERIAL：The women Infinity scarf is made of super soft material, light and warm.And it is not easy to deform after repeated use.Please avoid machine wash.
HAND MADE DESIGN:The knit scarf is made by hand knitting and winding design, it is not easy to take off line, and added layer sense, more fashion.And enough length allows this knit scarf to be worn as a single or double loop. FASHION COLLOCATION:This circle loop scarf is perfect to wear daily on the go. Can be worn in different styles. The cckiise Thick knit loop circle scarf for style and warmth perfect for outdoors and indoors. Great for dressing up any outfit during fall and winter, suitable for both formal and casual occasion. 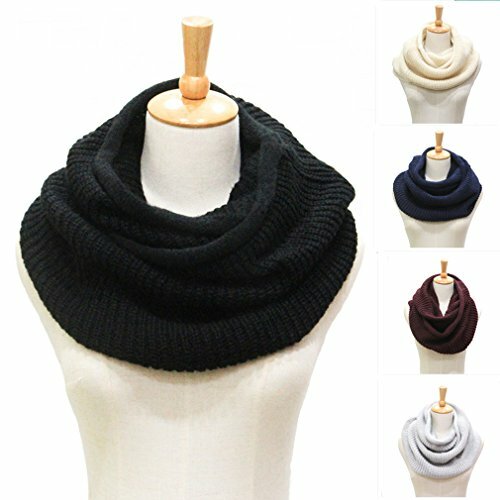 EXTENSIVE USING：The fashion soft Circle Loop Scarves can be styled with your blouse, shirts, sweater, jacket, jeans or evening dress for a charming look. They come in 5 different kinds of solid colors and can be worn by women and also by men. Popular for both adults and teens. GREAT GIFT:Each of our cckiise fashion scarves goes through strict inspection to ensure there are no flaws; Each winter scarf is beautifully wrapped in bags and is the best choice for a gift.